I could totally be one of those mothers who hijacks her child's art projects in order to make it the best in the class. I've got that competitiveness in me, and I love arts and crafts. I have fun ideas and love a well-made, mess-free final product. So when a project is assigned from school, I have to make a huge effort to stay the heck out of it and let my child take the lead. 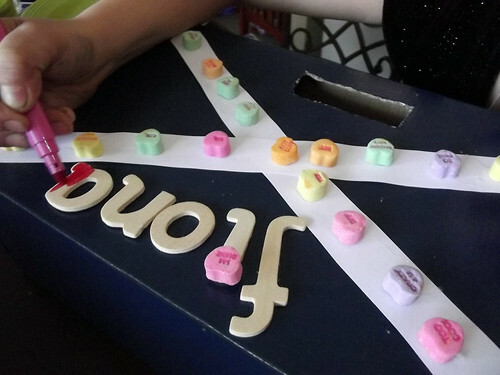 Kids are making their Valentine's Mailboxes for school parties tomorrow. Fifi's class is no exception. 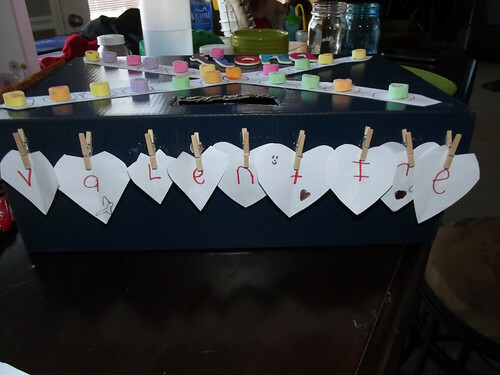 A letter went home with the students informing parents that the boxes need to be made at home and brought into school, and there would be a competition for Most Creative, Most Loving, Most Whatever-else-the-teacher-could-think-of. The letter mentioned 'Cute ideas can be found on Pinterest!' Bloody Pinterest. 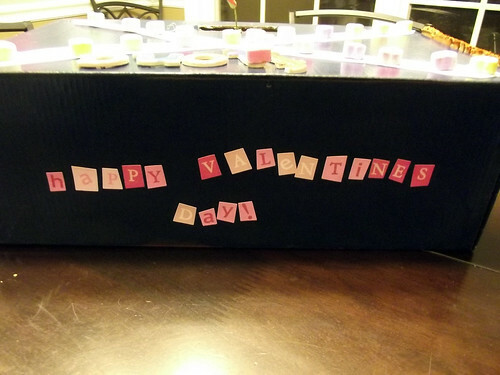 I haven't made a Valentine's mailbox since elementary school, and that was long before Pinterest took over our imaginations. My mailboxes were shoeboxes covered in wrapping paper (or at least brown packaging paper) and covered with stickers and marker drawings. Glitter was considered high-brow. I took the letter's advice (BAD) and looked on Pinterest for ideas. BOY, DID THEY HAVE SOME IDEAS. 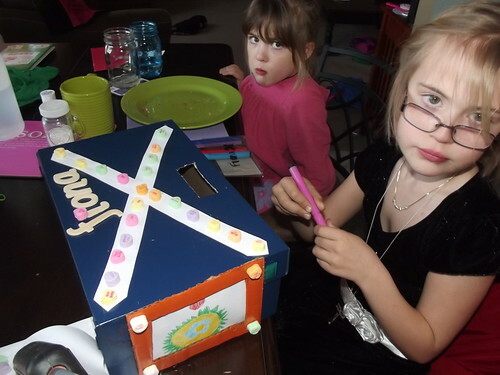 I showed Fifi photo after photo of cute, intricate, creative, stylish, award-winning mailboxes. She loved all of them but didn't want to do any. Fifinally I came to my senses and like a proper mother asked, "What do you have in mind for your box then?" She thought for a moment and said, "I'd like the top to look like a Scottish flag. On the side, I could have a picture frame or something." There was nothing on Pinterest that looked like a Scottish flag with a picture frame on the side. I was pleased and humbled by her individual creativity. So I bought some blue spray paint (because we all know I love spray paint), and while she was at school, I prepped her shoebox by painting it blue for her. By the way, spray paint doesn't apply well to cardboard, I've discovered. I used an entire can on that baby, about six coats, to get the Nike swoosh to finally go away. Yesterday we got out my trusty hot glue gun and glued down two white strips of paper, creating the Scottish saltire across the top of her mailbox. We cut out a picture frame from a scrap piece of cardboard, and Fifi helped me spray paint it orange. (By helped, I mean, she picked out a color from my collection of cans and stood back while I sprayed. Baby lungs, people.) She drew a picture for inside the frame. I thought she was done, but no sir. She had other plans. Every side needed something. So today I pulled out my craft box, and we started brainstorming. At the library this morning, Lolly got to do a project using foam Love Hearts, and it had given me an idea. 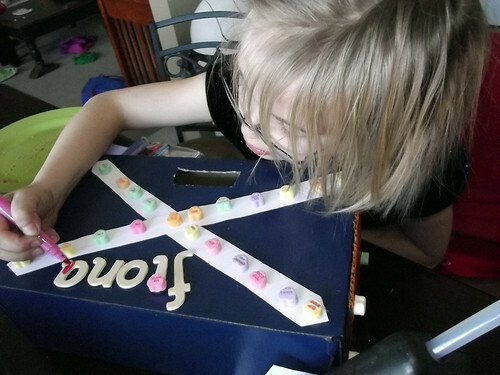 I had a bag of real Love Hearts which I allowed Fifi to hot glue all over the box. I imagined a nice little frame made of candy all around the flag, but she had different ideas. So I once again, stood back and let my kid direct the project. I love what she did with them. You'd never think she was actually having fun based on this face! She placed them along the white cross of her flag. It wasn't what I'd have done, but it's how she wanted it, and it turned out really great. We then found some wooden letters. I've been holding onto these wooden letters for years, not wanting to waste them, but today I decided it was time to USE the craft items. She spelled out her name on the box with them. Then she colored the letters in with markers and dotted the 'i' with a Love Heart. Won't be using those letters again, I guess. I also had some miniature clothes pegs in my craft box, so she got the idea to peg little pictures or words along the side. I suggested 'Be Mine' or 'Love' (not wanting to use all my pegs!) but she wanted 'Valentine'. So we glued on the pegs, and I showed her how to cut hearts out of folded paper. Most of her hearts looked like those pixelated Space Invaders, but oh well! She pegged the hearts to the box. It turned out super cute! 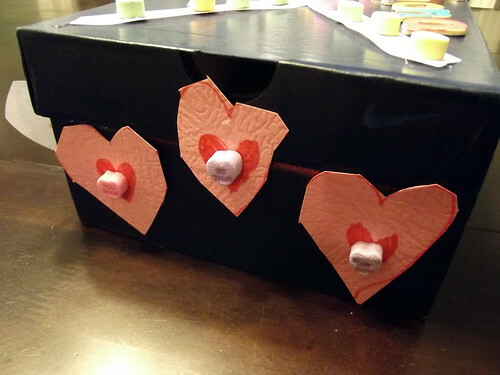 On the next side, she drew some hearts on pink cardstock and glued a Love Heart in the middle of each. I call this the Triple Hearts side. I think the whole box looks fantastic. I know it's easy to get caught up in our kids having the "best", most impressive projects, but really, that's not what it's all about. The real point is letting the kids get creative themselves, letting them come up with their own ideas, and then helping them see it through. I'm not criticizing ANYONE for doing awesome Pinteresty projects; if Fifi had wanted to do one, we would have, and I would've LOVED it. I'm AMAZED by how cool some of my friends' kids' mailboxes are. (I'm thinking in particular of a Facebook picture of the most awesome shark mailbox I've ever seen. I am so not criticizing this stuff!) What I'm more pointing to is the temptation to take over their projects for them, and make them do what we, as the parents, think is the best way. This not only deprives them of the opportunity to be creative and think for themselves, but it also undermines their confidence. When we shoot down their ideas in preference to our own, we're only teaching them that they are not as creative as we are nor as capable. Their ideas may not win them the class competition, but who cares? It's often, I've found, the parents, with their parental pride, that cares more about winning those competitions than the kids do. Sure Fifi mentioned that she wanted to win, and of course she wants to win. I just reminded her that winning the competition is only part of the fun. Having a blast with glue and markers, coming up with fun ideas, and making her ideas come to life is the good stuff. Whoever gets picked, I reminded her, will have worked just as hard as she did, but hopefully she'll have had the most fun! I've seen a refreshing number of friends on Facebook remark that their kids have just colored and glued and stuck stickers on their boxes. I've seen a refreshing number of people suggest we all stop competing with other parents via our children. Furthermore, my saying I let Fifi take the lead and do her own thing is also not meant to be another version of "competition" or "out-mothering you". We can compete with each other by our non-competitiveness too. ("I'm less competitive than you, na-nana-na boo boo!") All I'm really saying is, it's the child's project. Not ours. We had our turn, back in the day. Now if we feel the need to out-craft each other, that's what bloody Pinterest is for. But let's keep the parent competition out of our kids' classrooms. They have enough peer competition to deal with as it is.